Great hostel and wonderful staff! Great place to stay ! The owner is super nice, the rooms are comfortable and the bathroom is clean. Plus the omelettes are delicious !! A great hostel in UB!! The hostel is clean and conveniently located. Our host Enkhuush was amazing and helped us arrange a trip to the Gobi. She was aware of our budget and was able to arrange something in our price range. We letf UB a few times for side trips and came back to this hostel every time! Enkuush is a great host! I ended up staying here three times between all my Mongolian adventures due to the great location (right near the State Department Store, Beatles Square, Seoul Street and train station), affordable price, homely atmosphere and Enkuush's hospitality. Also, the deck area is a nice place to relax! I stayed in July. Excellent communication with the hostel owner before arrival. The location is great for everything in UB. 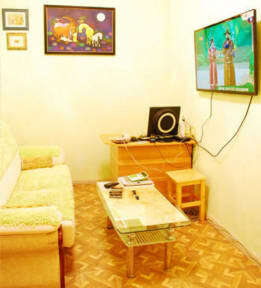 This is a family run guest house and Enkhush is very relaxed and friendly hostel owner. The bedrooms are up stairs inside the family flat,which is seperate flat to the down stairs dorm rooms,kitchen and nice outdoor seating area. If you like quiet places then this is a very nice place to stay. It was also great that the other guests were all really friendly too! Guesthouse run by a family. Cozy and welcoming. Right in the center of the city. Small negative point: it's an apartment in a building and you don't receive a key. You need to ring to enter. I had to phone call them once because the building door was closed. Staff very welcoming and very helpful. Nice breakfast and nice hot showers. The mattress is a little bit thin though and the pillow hard, but if you've never been to Mongolia before, you'll notice that it's like that pretty much everywhere. It's also hard to find. Anyway, a nice family owned hostel.